Download "Thought Leadership White Paper"
4 rate will exceed 10 percent. While legal departments and sourcing professionals are driving much of that growth, sales, marketing, and HR departments are also catching on quickly. 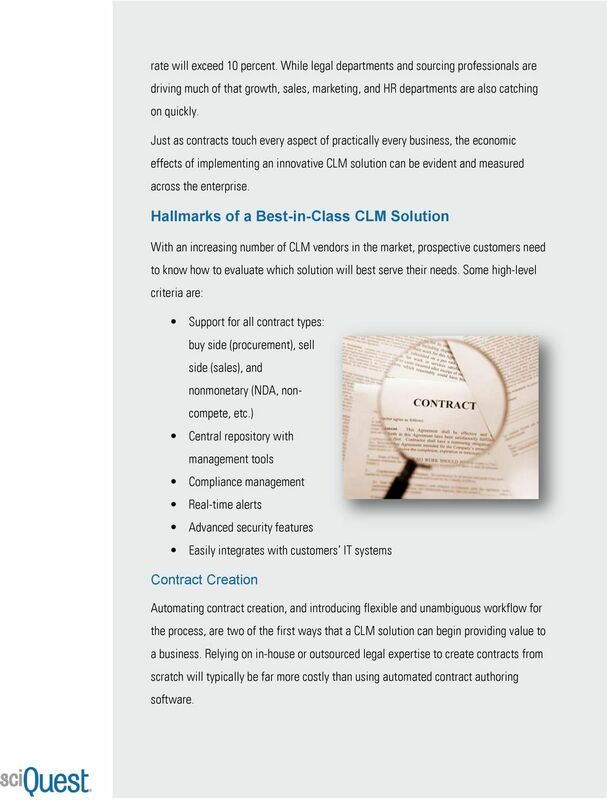 Just as contracts touch every aspect of practically every business, the economic effects of implementing an innovative CLM solution can be evident and measured across the enterprise. Hallmarks of a Best-in-Class CLM Solution With an increasing number of CLM vendors in the market, prospective customers need to know how to evaluate which solution will best serve their needs. Some high-level criteria are: Support for all contract types: buy side (procurement), sell side (sales), and nonmonetary (NDA, noncompete, etc.) Central repository with management tools Compliance management Real-time alerts Advanced security features Easily integrates with customers IT systems Contract Creation Automating contract creation, and introducing flexible and unambiguous workflow for the process, are two of the first ways that a CLM solution can begin providing value to a business. Relying on in-house or outsourced legal expertise to create contracts from scratch will typically be far more costly than using automated contract authoring software. 7 of a contract carry all required clauses, and by verifying the satisfaction of contract commitments. 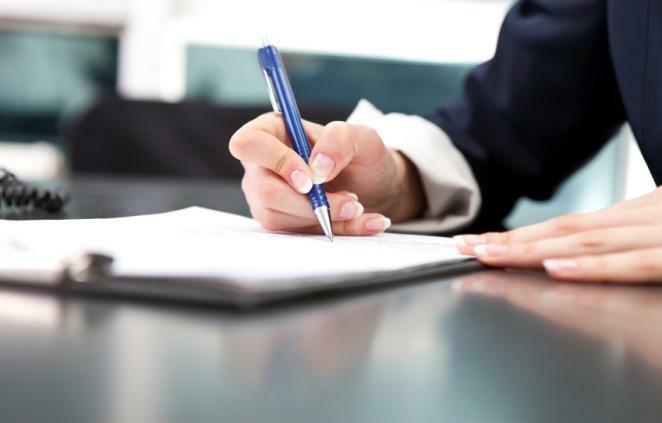 Compliance items the terms or clauses that control the contractual relationship could be related to insurance, credit risk, certifications, and so on. 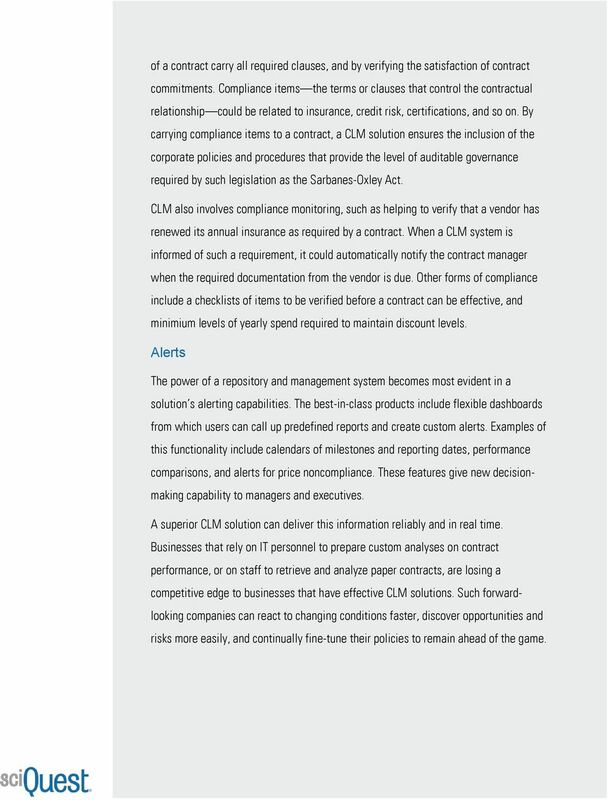 By carrying compliance items to a contract, a CLM solution ensures the inclusion of the corporate policies and procedures that provide the level of auditable governance required by such legislation as the Sarbanes-Oxley Act. CLM also involves compliance monitoring, such as helping to verify that a vendor has renewed its annual insurance as required by a contract. 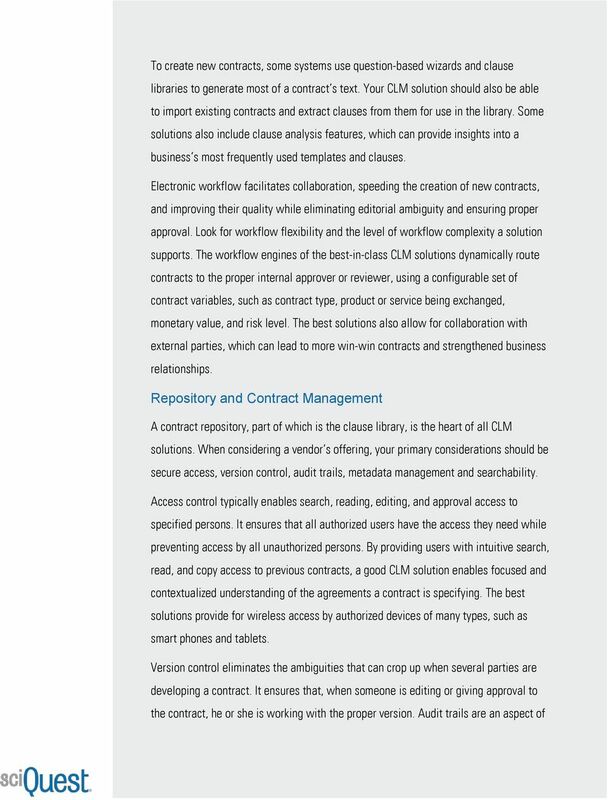 When a CLM system is informed of such a requirement, it could automatically notify the contract manager when the required documentation from the vendor is due. Other forms of compliance include a checklists of items to be verified before a contract can be effective, and minimium levels of yearly spend required to maintain discount levels. Alerts The power of a repository and management system becomes most evident in a solution s alerting capabilities. The best-in-class products include flexible dashboards from which users can call up predefined reports and create custom alerts. Examples of this functionality include calendars of milestones and reporting dates, performance comparisons, and alerts for price noncompliance. These features give new decisionmaking capability to managers and executives. A superior CLM solution can deliver this information reliably and in real time. 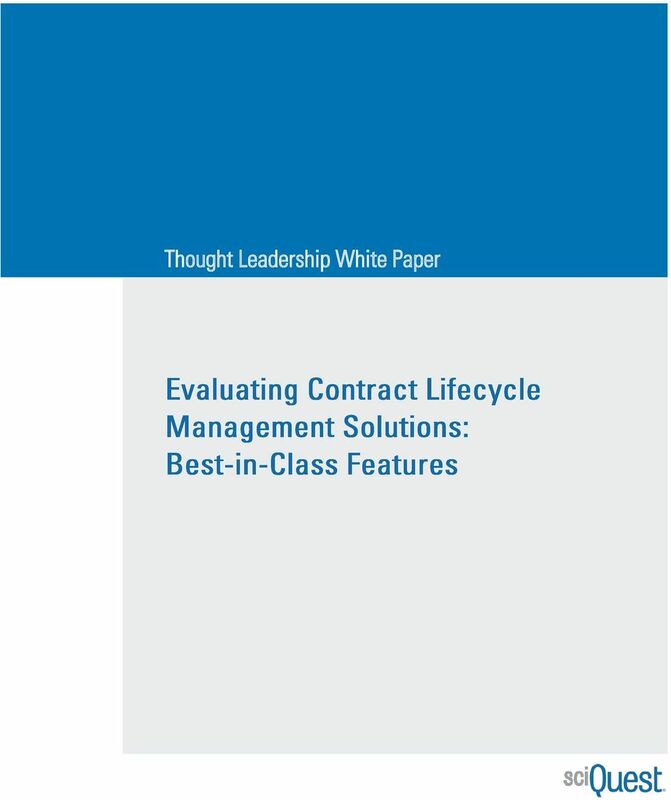 Businesses that rely on IT personnel to prepare custom analyses on contract performance, or on staff to retrieve and analyze paper contracts, are losing a competitive edge to businesses that have effective CLM solutions. Such forwardlooking companies can react to changing conditions faster, discover opportunities and risks more easily, and continually fine-tune their policies to remain ahead of the game. 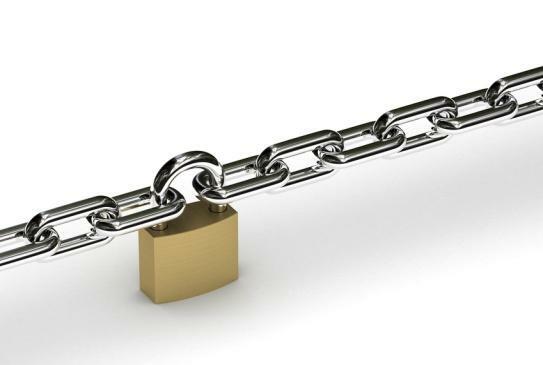 8 Security Naturally, you want your CLM solution to provide all the security you have depended on to this point.  That means a repository with a hierarchical system of document access. Depending on your industry, access to areas of the repository can be based on organization unit, user role, or at the individual level. The system should recognize users attempting to access documents as not authorized, and authorized for read only, read and edit, and read, edit, and approve. 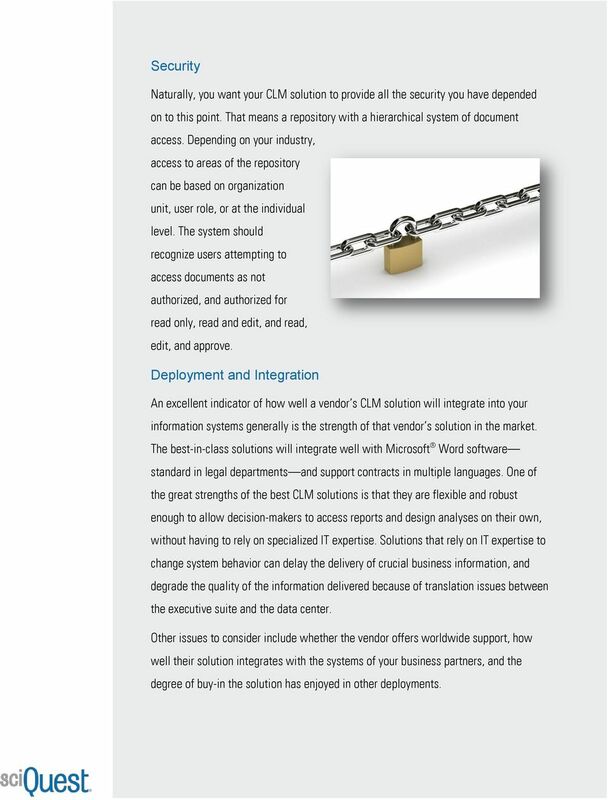 Deployment and Integration An excellent indicator of how well a vendor s CLM solution will integrate into your information systems generally is the strength of that vendor s solution in the market. The best-in-class solutions will integrate well with Microsoft Word software standard in legal departments and support contracts in multiple languages. One of the great strengths of the best CLM solutions is that they are flexible and robust enough to allow decision-makers to access reports and design analyses on their own, without having to rely on specialized IT expertise. Solutions that rely on IT expertise to change system behavior can delay the delivery of crucial business information, and degrade the quality of the information delivered because of translation issues between the executive suite and the data center. Other issues to consider include whether the vendor offers worldwide support, how well their solution integrates with the systems of your business partners, and the degree of buy-in the solution has enjoyed in other deployments. 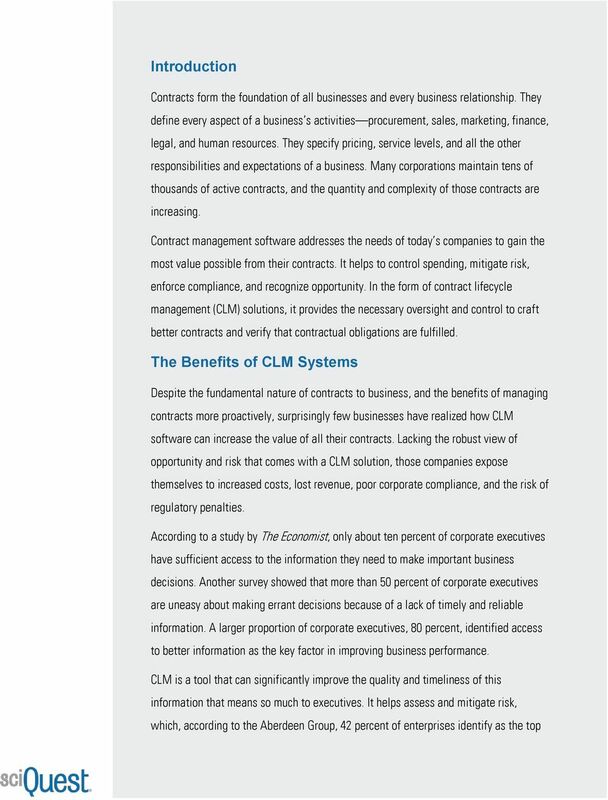 9 Best-in-Class CLM: Smoothly Delivering Positive Business Results A contract lifecycle management system can quickly prove its worth by reducing the costs of paper-based contract management, and increasing revenues through the creation and improvement of CLM-produced contracts. 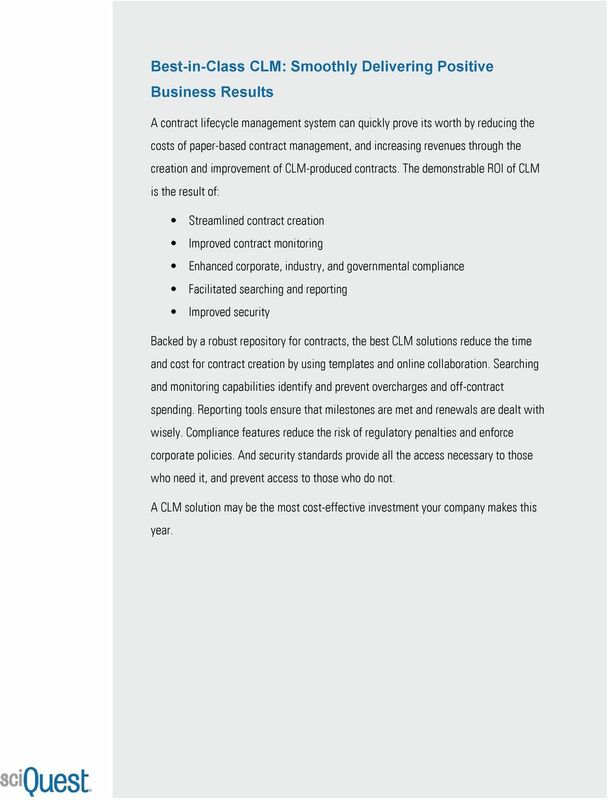 The demonstrable ROI of CLM is the result of: Streamlined contract creation Improved contract monitoring Enhanced corporate, industry, and governmental compliance Facilitated searching and reporting Improved security Backed by a robust repository for contracts, the best CLM solutions reduce the time and cost for contract creation by using templates and online collaboration. Searching and monitoring capabilities identify and prevent overcharges and off-contract spending. Reporting tools ensure that milestones are met and renewals are dealt with wisely. 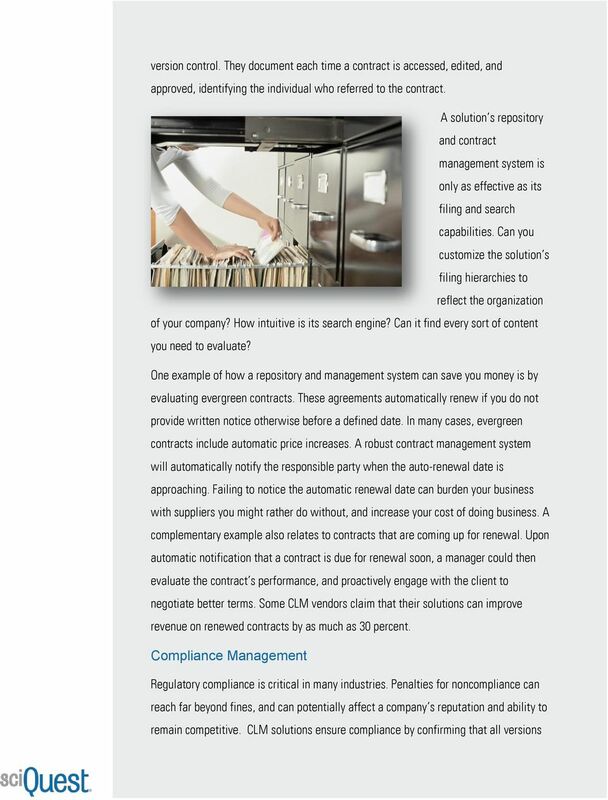 Compliance features reduce the risk of regulatory penalties and enforce corporate policies. And security standards provide all the access necessary to those who need it, and prevent access to those who do not. 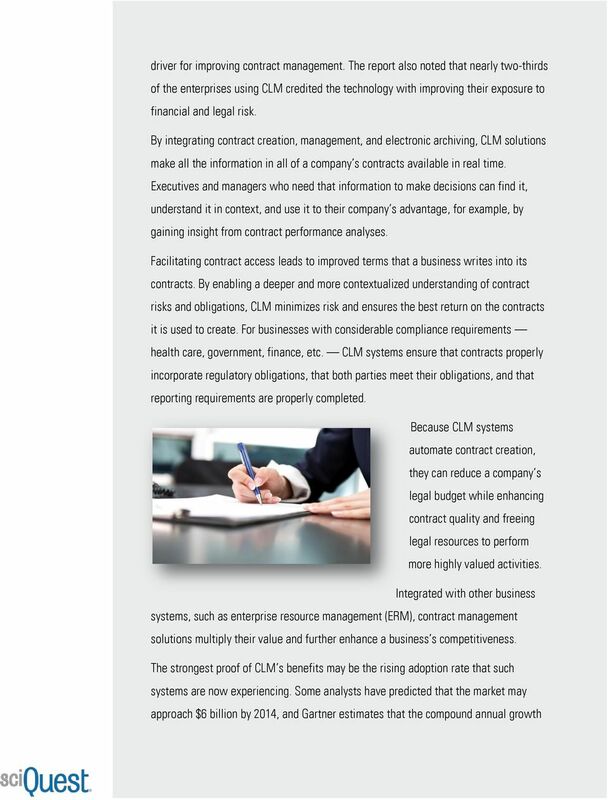 A CLM solution may be the most cost-effective investment your company makes this year. 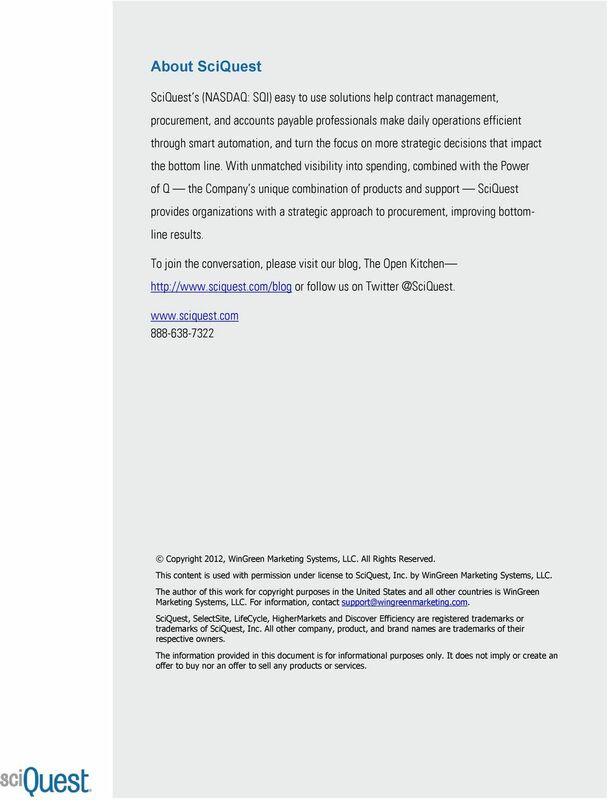 10 About SciQuest SciQuest s (NASDAQ: SQI) easy to use solutions help contract management, procurement, and accounts payable professionals make daily operations efficient through smart automation, and turn the focus on more strategic decisions that impact the bottom line. With unmatched visibility into spending, combined with the Power of Q the Company s unique combination of products and support SciQuest provides organizations with a strategic approach to procurement, improving bottomline results. To join the conversation, please visit our blog, The Open Kitchen or follow us on Copyright 2012, WinGreen Marketing Systems, LLC. All Rights Reserved. This content is used with permission under license to SciQuest, Inc. by WinGreen Marketing Systems, LLC. The author of this work for copyright purposes in the United States and all other countries is WinGreen Marketing Systems, LLC. For information, contact SciQuest, SelectSite, LifeCycle, HigherMarkets and Discover Efficiency are registered trademarks or trademarks of SciQuest, Inc. All other company, product, and brand names are trademarks of their respective owners. The information provided in this document is for informational purposes only. It does not imply or create an offer to buy nor an offer to sell any products or services. Veramark White Paper: Reducing Telecom Costs Why Invoice Management is the Best Place to Start. WhitePaper. We innovate. You benefit. 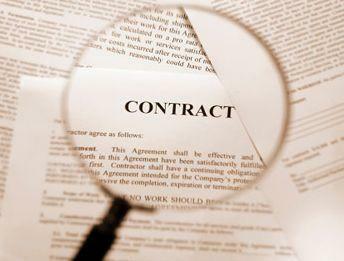 Is your Contract Management just Good Enough? A SELECTICA GUIDE ALL THINGS STARK LAW WHAT IS STARK LAW, AND HOW CAN CONTRACT MANAGEMENT SOFTWARE HELP YOU COMPLY? HP Software Licensing and Management Solutions (SLMS) Helping organizations maximize their software investment.